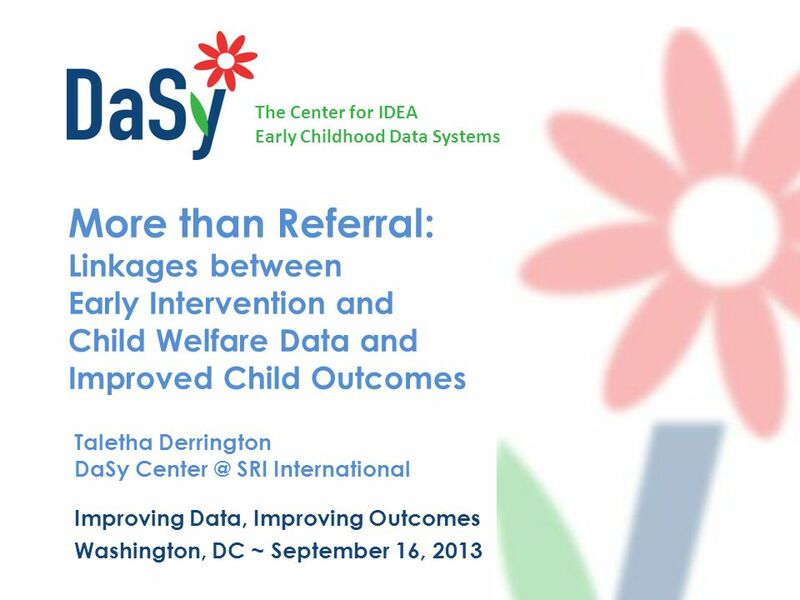 The Center for IDEA Early Childhood Data Systems More than Referral: Linkages between Early Intervention and Child Welfare Data and Improved Child Outcomes. 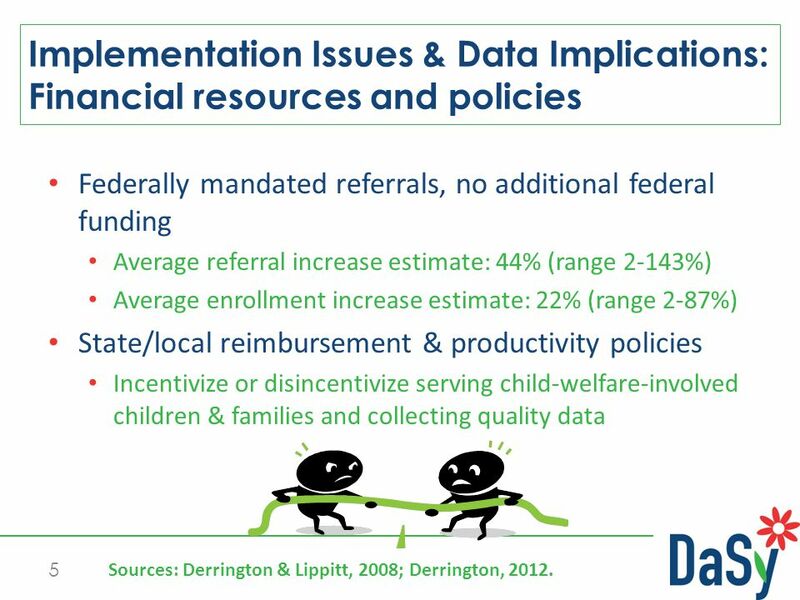 5 Federally mandated referrals, no additional federal funding Average referral increase estimate: 44% (range 2-143%) Average enrollment increase estimate: 22% (range 2-87%) State/local reimbursement & productivity policies Incentivize or disincentivize serving child-welfare-involved children & families and collecting quality data 5 Implementation Issues & Data Implications: Financial resources and policies Sources: Derrington & Lippitt, 2008; Derrington, 2012. 10 References 10 Derrington, TM and Terreault, S (2007). 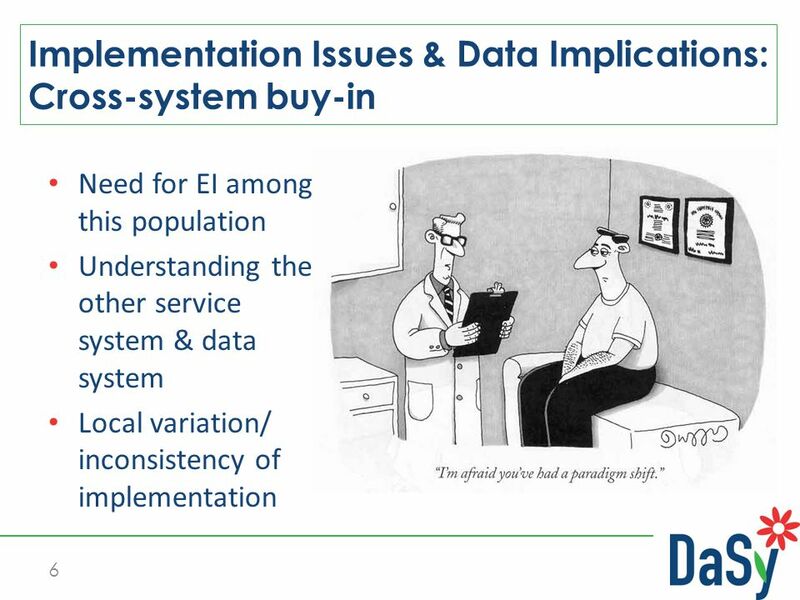 Rhode Island’s Experience with Federally Mandated Referrals from Child Welfare to Part C Early Intervention. 22nd National Training Institute, ZERO TO THREE: National Center for Infants, Toddlers, and Families, Orlando, FL. 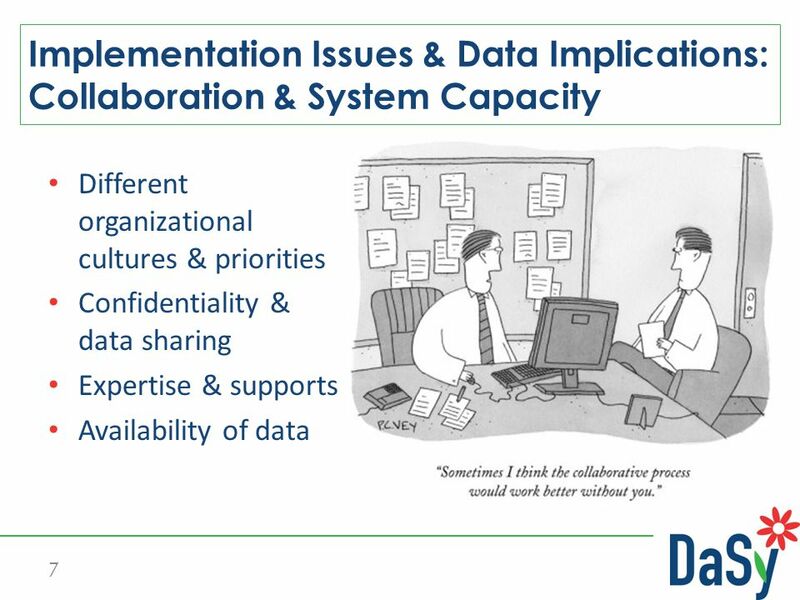 Derrington, TM & Lippitt, JA (2008). 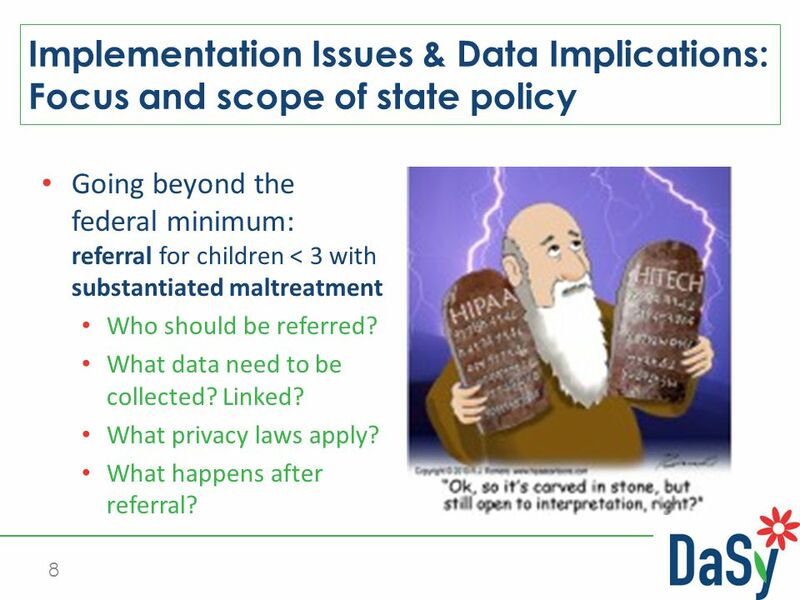 State-level impact of mandated referrals from child welfare to Part C Early Intervention. Topics in Early Childhood Special Education, 28(2), 90-98. Derrington T (2012). Drug-Exposed Young Children and Early Intervention: What influences service engagement? Ann Arbor, MI: UMI/ProQuest Dissertations and Theses. Gomm, A (April 2007). 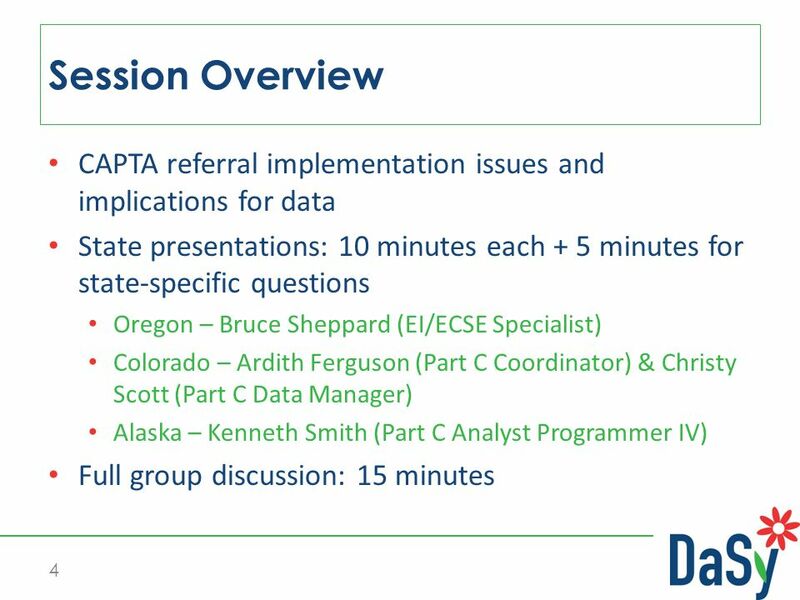 CAPTA Implementation in New Mexico. Presentation at the Georgetown National Technical Assistance Call. Herman, B (2007). 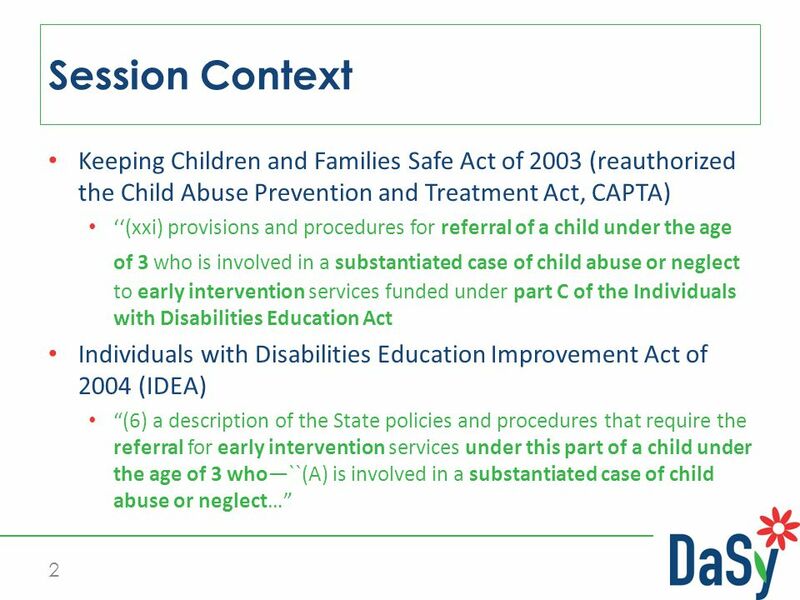 CAPTA and Early Childhood Intervention: Policy and the role of parents. Children & Schools, 29(1), 17-24. Individuals with Disabilities Education Improvement Act of 2004, 20 U.S.C. § 1400 et. seq., Pub. L. No. 108-446. Keeping Children and Families Safe Act of 2003, 42 U.S.C. § 1 et. seq., Pub. L. No. 108-36 Kinavey, E (August 2008, personal communication). Roper, K (January 2007). Massachusetts Early Childhood Linkage Initiative: Taking CAPTA pilot to scale. Presentation at the Early Childhood Partners Meeting. Lamar, RR (2008). 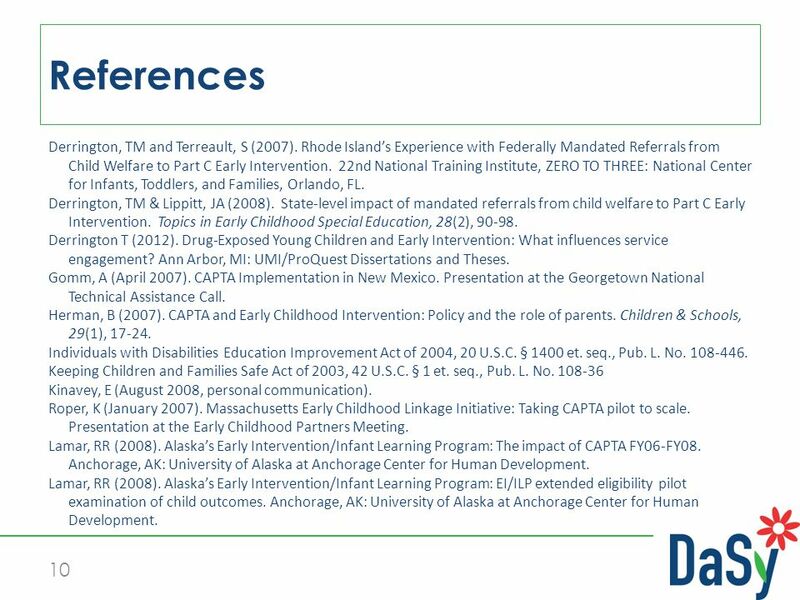 Alaska’s Early Intervention/Infant Learning Program: The impact of CAPTA FY06-FY08. Anchorage, AK: University of Alaska at Anchorage Center for Human Development. Lamar, RR (2008). Alaska’s Early Intervention/Infant Learning Program: EI/ILP extended eligibility pilot examination of child outcomes. Anchorage, AK: University of Alaska at Anchorage Center for Human Development. 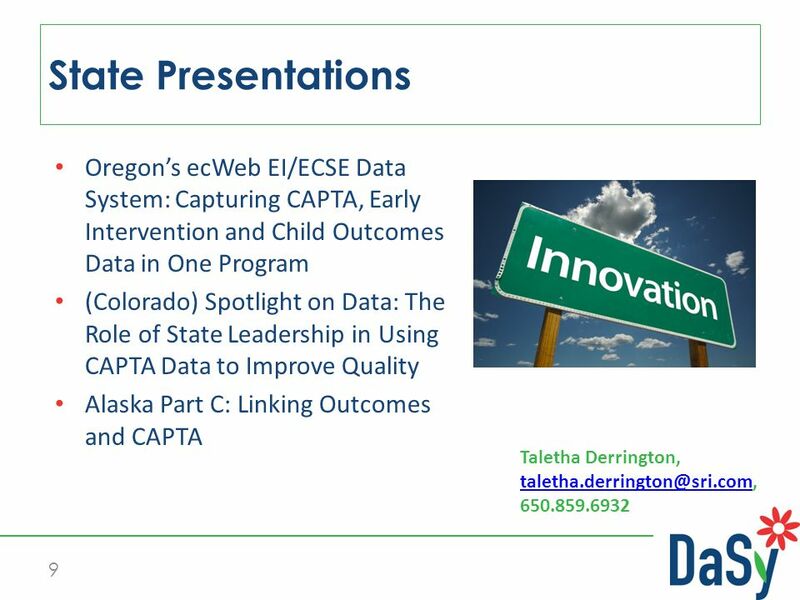 Download ppt "The Center for IDEA Early Childhood Data Systems More than Referral: Linkages between Early Intervention and Child Welfare Data and Improved Child Outcomes." Kansass Response to CAPTA Requirements Related to Substantiated Findings for Children Under 3 Boston, MA April 18, 2005 Paula Ellis Assistant Director. Overview of Governors Blue Ribbon Panel on Child Protection Presented to: Task Force on Child Protection August 16, 2007 Department of Children and Families. Strategies for Financing Quality Preschool: The Wisconsin Model Wisconsin State Superintendent of Public Instruction Elizabeth Burmaster Governors Forum. 15 Community Supported Relief Nurseries Across Oregon. 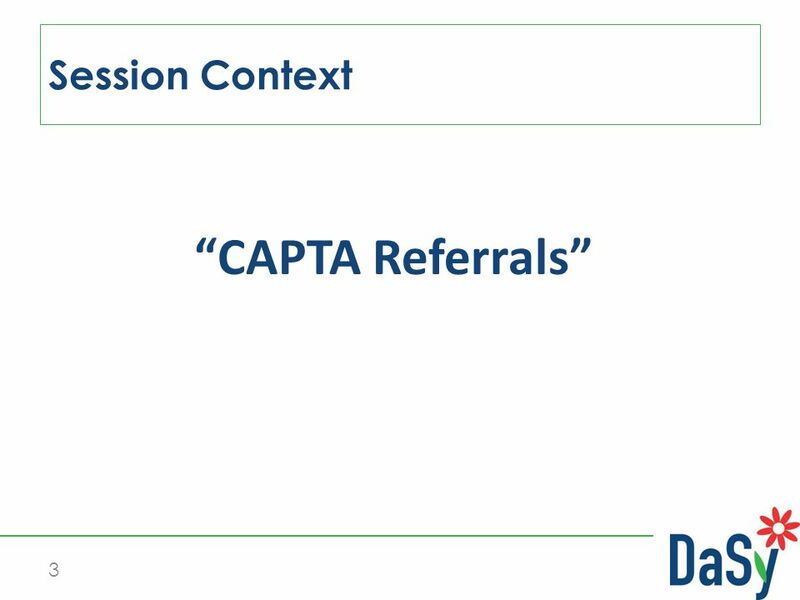 1 Implementing Part C Provisions Required Under CAPTA and IDEA Steven Rosenberg, Ph.D. Cordelia Robinson, Ph.D., RN University of Colorado at Denver and. National Consortium On Deaf-Blindness Families Technical Assistance Information Services and Dissemination Personnel Training State Projects.